Welcome to Fourteen Holy Helpers! Stay for the Post-Race Party! We will have canned beverages and food with entry fee before and after the race. Also featuring bounce houses, theme tray raffle, split club raffle and music. Fr. David Bellittiere held a Parish-Wide meeting on Monday, January 28, 2019 at 7:00 pm in the Church. Everyone was invited to attend. He gave a recap of the significant events that happened in 2018, as well as, his presentation on the status and direction of the parish in 2019. He also gave an opportunity for anyone in attendance to ask him questions about the parish. If you were unable to attend the meeting, but are interested in hearing the presentation and dialogue with attendees, you may listen by clicking on one of the following links. Easter Bunny Luncheon and Egg Hunt ~ Saturday Apr. 13 starting at 11 am in the Hall. Bring the Kids!! Call 674-2180 for reservations. $3 per person. BINGO at 14 Holy Helpers on Thursday nights has been a tradition for many people in the West Seneca/Cheektowaga/Buffalo area. To enhance your enjoyment of BINGO nights at 14 Holy Helpers we’ve added new games and brought in televisions and new calling equipment. We have start play at 7:00 PM to help you get home earlier. Come enjoy a BBQ hamburger and win some cash! Well over 500 people have taken advantage of the recording of selected weekend Masses that are available to you over the internet. Audio recordings are available for download for listening on your computer or for podcast access to an MP3 player. 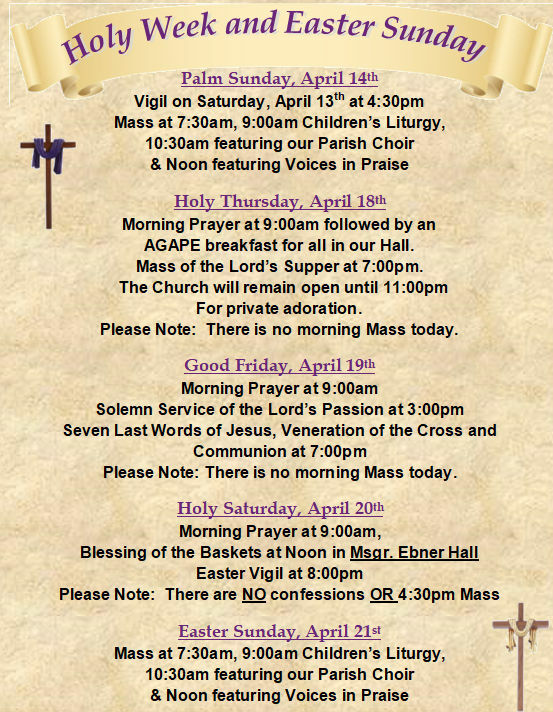 10 Masses are available for access with additional recordings being added regularly. If you use an RSS reader, that subscription service is also available. There is no charge for access to our Mass recordings. Interested? Go to 14 Holy Helpers Audio Recordings for more details. Are you an iPod user? Download our Masses to your iPod from Apple iTunes for FREE! A link is available on our Audio Page. On-line giving to 14 Holy Helpers is processed through a new program managed by Vanco Payment Solutions. Vanco is a large on-line payment processor for faith based organizations and is used by a number of parishes in the Diocese of Buffalo. As a PCI Level 1 compliant service provider they are dedicated to protecting the security and privacy of our donors. Making your payments on-line is easy. You can access our on-line system by clicking the blue Offering button found in the right hand column of our Home Page (see button below). You have the option to set up a donor profile to save your information for multiple donations … or make a one time donation without setting up a profile. Donations can be made via credit card or ACH withdrawal from a checking or savings account. The system is available now. 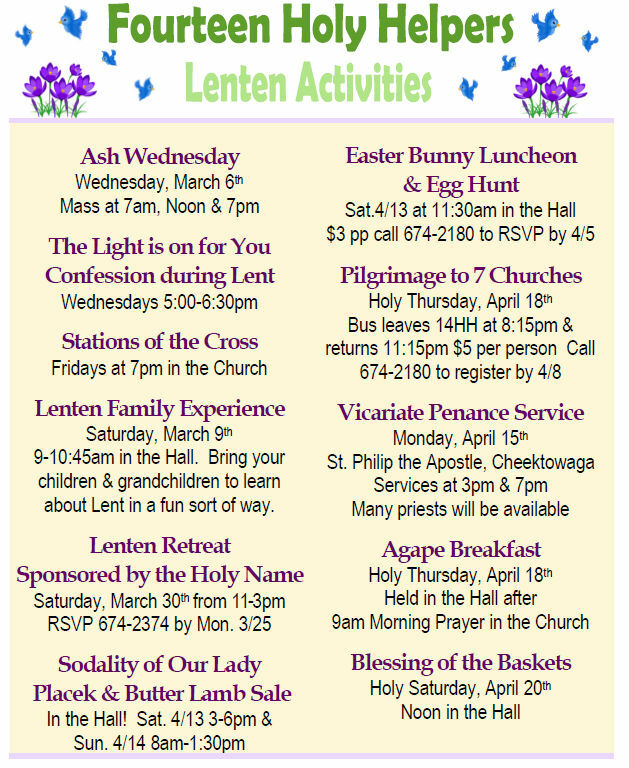 Call the Parish Business Manager, Rick Donovan, at the Rectory (716) 674-2374 with any questions. We have started to collect the history of our parish life through photographs. If you have any pictures that you would like to share with us please contact our Webteam. Our current collection can be seen at the following link … 14 HH Pictorial.